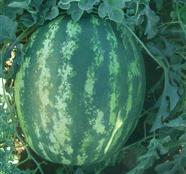 Round diploid crimson sweet hybrid watermelon. Strong vine growth displaying heavy set potential. The round, 10 - 13 Kg fruits, exhibits a crimson sweet rind and a bright red flesh. Charm F1 is a very productive variety with high brix and great uniformity.